ZBrush provides artists with faster ways to realise their ideas, and one of the best is Mannequins. Mannequins are essentially ZSphere armatures. The way that you interact with them allows for easy posing, so that you can quickly explore a character’s pose or put together multi-character scenes. The great thing abvout using Mannequins is that you don’t have to model anything. You already have the model set up and ready to go. Later on, if you need to, you can skin the Mannequin to make a mesh you can sculpt. 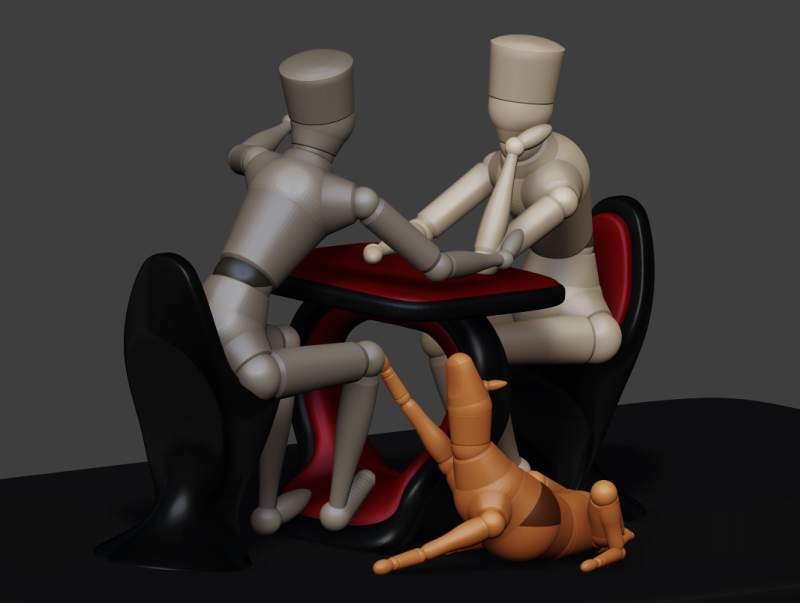 Several Mannequin Scenes are included in the Projects folder of Lightbox. Switch out of Adaptive Skin mode if necessary. If you can see a quad mesh over the Mannequin then you are in Adaptive Skin mode – press A on the keyboard. Turn on the Move switch on the top shelf. Set the Draw Size to a low value – about 10. If you use a large draw size while posing you may move parts of the Mannequin that you wanted to stay put. Click+drag on the Connecting ZSpheres – the bone part of the Mannequin. This will move the bone using forward kinematics. If you continue dragging in a straight line the limb will straighten in the direction of the cursor. Ctrl+click on a ZSphere – the joint of the Mannequin – to move it in tha same way, using forward kinematics. You can adjust Mannequins in just about anyway you wish. You can change the proportions, scale or even add new body parts to create new characters! Alt click+drag on a Connecting ZSpheres bone to stretch or shorten the bone. Click+drag on a ZSphere joint to reposition the joint relative to the bones. Alt click+drag on a ZSphere joint to reposition the whole body part. Make sure the Draw Size is set quite small. Ctrl+lick+drag on the Root ZSphere. You can recognize the Root ZSphere as it will always be two-toned, even when it is not selected. Click between two joints to add a new joint. Alt+click on a joint to remove it. Adjust the Size slider in the Tool>Deformation menu. Switch on the Scale switch on the top shelf. Click+drag up or down on the joint or bone. Before rotating a Mannequin you may want to position the figure at the canvas origin. With the Floor visible (press Shift+P) the origin is shown by the intersection of the red, green and blue axes. Make sure the Y axis is selected for the the Rotate slider in the Tool>Deformation menu. Turn off the Z axis by clicking on the little Z. Turn on the Y axis by clicking on the little Y. Adjust the Rotate slider in the Tool>Deformation menu. It’s not difficult to create your own Mannequins. Make a ZSphere model of the character you want. 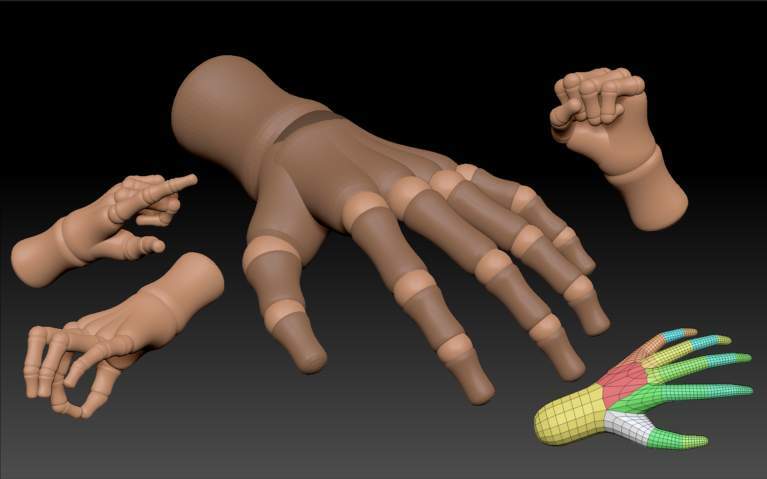 The method used is the same as previous versions of ZBrush except for when moving link spheres to lengthen joints you need to hold the Alt key. You’ll need two meshes to create the Mannequin. They can be any shape but to start with select the Sphere3D and the Sphereinder3D and make each a polymesh by pressing the Tool>Make Polymesh3D button. Reselect the ZSphere model and open the Tool>Adaptive Skin menu. You might want to open the Tool palette in the Right or Left tray for easy access. Switch on Tool>Adaptive Skin>Use Classic Skinning. Switch to Move mode by pressing ‘W’. This will mean you can select ZSpheres without adding new ones. If you made the ZSphere model with symmetry on make sure it is on now. Click on a Link Sphere (between two ZSpheres)to select it. Then press Tool>Adaptive Skin>Insert Connector Mesh and choose the PM3D_Sphereinder3D from the pop-up. The link will be replaced by the Sphereinder polymesh. Click on all the other Link Spheres in turn and insert the PM3D_Sphereinder3D. Don’t worry if the ZSpheres disappear. When all the links are replaced click on the Root ZSphere to select it. You can recognize the Root ZSphere because it is always two-toned, whether selected or not. Press the Insert Local Mesh button and choose the PM3D_Sphere3D from the pop-up. Your Mannequin should now be complete. If you want you can fill it with a color by pressing Color>Fill Object. You can use any polymesh to replace either a ZSphere or Connecting Sphere, although for best results use simple meshes of not too many polygons. Simply select the ZSphere by clicking on it in Move mode, press the Insert Local Mesh button (for joints) or Insert Connector Mesh (for bones) and then select the mesh from the pop-up. In this way you can change single ZSpheres or Connecting Spheres anywhere on the Mannequin. Preview the mesh by pressing A on the keyboard. In Classic Skinning mode the Mannequin will keep its shape but the joints and bones are all separate meshes. You can see this if you turn on polyframes (Shift + F). Although you could create a mesh like this it would not sculpt very well. Turn off Use Classic Skinning in the Tool>Adaptive Skin menu. (This switch can only be pressed in ZSphere mode, so press ‘A’ again to leave preview mode, if necessary.) Now if you preview the mesh you will see that there is a single unified mesh. This will sculpt well but it has lost the shape of the Mannequin. With Use Classic Skinning turned off press Tool>Adaptive Skin>Make Adaptive Skin. This will create a new mesh in the Tool palette. Switch Use Classic Skinning back on and make sure the Mannequin is in preview mode. Press Tool>SubTool>Append and choose the mesh you created at (3). It will be added as a new SubTool. Select the new SubTool and then go to the Projection Shell slider at the bottom of the SubTool menu. Adjust the slider until the mesh completely covers the Mannequin. Press Tool>SubTool>Project All. The unified mesh will now closely resemble the Mannequin (turn on Solo mode – the bottom right of the UI – to see the mesh on its own). You can now sculpt this mesh further. After posing the Mannequin, turn off the Tool>Adaptive Skin>Use Classic Skinning button. Set the Tool>Adaptive Skin>Density slider to 2. Press the Tool>Adaptive Skin>Make Adaptive Skin button. Select the new mesh in the Tool palette. Switch on Activate Symmetry and Use Posable Symmetry in the Transform palette.